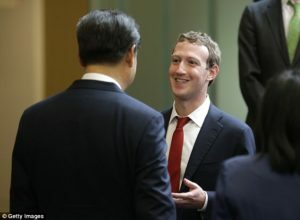 When it comes to the Far East, the “more open” world takes a back seat as Facebook CEO Mark Zuckerberg appears to be more in line with the Chinese Communist Party’s (CCP’s) core interests. Long blocked from the lucrative Chinese market, Facebook has now developed software to suppress posts that appear in people’s news feeds in specific geographic areas, current and former employees of the Internet giant revealed. The development of the censorship tool comes after Zuckerberg invested a large amount of time trying to crack the Chinese market, paying multiple visits, meeting with President Xi Jinping and even making an effort to learn Mandarin. China has streamlined and tightened its controls over the Internet under Xi. Facebook has in the past restricted content in such countries as Russia, Pakistan and Turkey. But the new software takes that a step further by preventing content from ever appearing in feeds in China. Unveiling a new censorship tool in China could lead to more demands on Facebook to suppress content from other countries. “The fake-news problem, which has hit countries across the globe, has already led some governments to use the issue as an excuse to target sites of political rivals, or shut down social media sites altogether,” the Times reports said. Over the summer, several Facebook employees who were working on the suppression tool left the company, the current and former employees told the Times. Zuckerberg told a gathering of employees that Facebook’s China plans “were nascent. But he also struck a pragmatic tone about the future,” according to employees who attended the gathering.